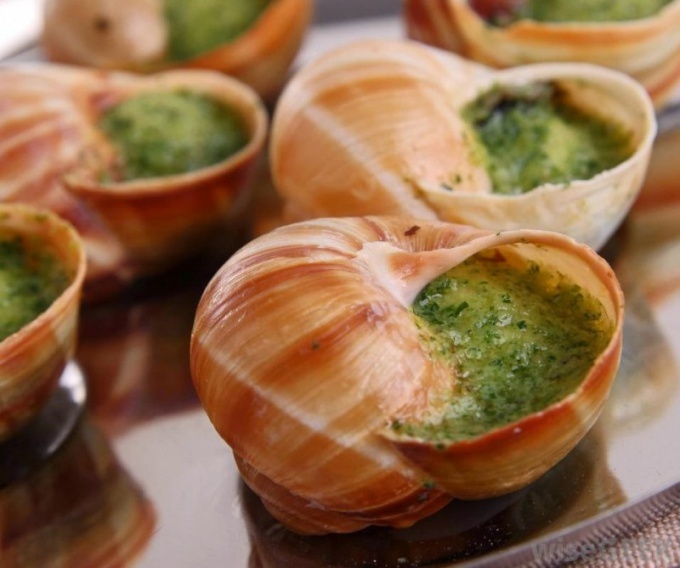 Snails are one of the products considered in Russia very exotic, but in France they are often served as a snack with herbs and aromatic oils, hot sauces, or just with white bread. If you want to handle these mollusks, like a real Frenchman or a refined French, you should familiarize yourself with the rules for their use. Snails eat boiled or baked, they are often non - meat ingredient in more complex dishes. Shellfish are washed before cooking, then boiled or baked. If you want to cook snails, bring a few liters of water to a boil, then put the snails and cook, stirring, for 5 minutes. Remove the meat from the shells, wash it in vinegar and then in water to remove mucus, and then cook together with herbs, salt and pepper. Snail meat is put into a risotto, salad greens, served with pasta, prepared from a zhuleny. Restaurants often serve baked snails in shells. First, prepare a lot of minced shallots, garlic, softened butter, lemon juice, salt and chopped parsley. Washed and drained clams, cover with oil mixture and put in 20 minutes in the refrigerator and then baked. In very expensive restaurants prepare a more complex dish of snails - tender pieces of baked baskets of puff pastry with a sauce of heavy cream, spinach and Parmesan. Most often difficulties arise with the supply and consumption of snails in the shells. For them there is a special serving dish with small pits, allowing you to place them with the hole facing up so as not emerged juice. Since the French name of the edible snails - escargot, a dish such as a ceramic or cast iron cookware for baking, is also called escargots or escargotiere. Escargotiere only happens on an even number of molluscs - 6, 12 or 24. According to etiquette, the snails are served with special tongs and small thin fork on a long handle with two prongs. As snail slippery and hot, they are holding a special nippers (also called escargots tweezers) until you take out the meat with a fork. Then slice dipped in sauce and eaten with a slice of baguette, washed down with white wine. If you do not have at hand crimper, etiquette allows you to take the snail in hand, wrapping it with a cloth, and remove the meat. If snails are served without a shell, their meat eating as anything else, Cutlery, knife and fork. Although there are about 100 varieties of edible snails, to find one in your garden will not be easy, unless you live somewhere in France or the Mediterranean region. It was there that prefers to dwell in most of these edible molluscs. One of the first snails that were eaten by the ancient Greeks and Romans is called Burgundy or in the memory of its glorious past, Roman. It reaches 10 inches in length, and different round body cream or light brown color. These snails are so popular that they are bred in Europe and also in USA and some Asian countries. In wild nature they are almost destroyed, so in most of the European countries are protected. Gastronomy competitor of the Roman snail - a snail Turkish. Annual imports of these shellfish reaches 600 tons. These snails can be found in the South of Russia. They reach 2 inches in height and are of a brown shell with a creamy longitudinal stripes. But even if you happen to find in your garden are edible snail, is it right impossible. Collected in the wild snails within two weeks should be fed with corn meal, waiting until them come out all harmful substances.